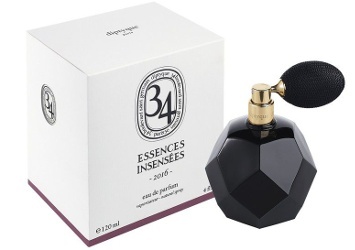 Diptyque will launch Essences Insensées 2016, the third limited edition harvest-based fragrance in the La Collection 34 series (see Essences Insensées 2014 and Essences Insensées 2015). This year's edition centers on the May rose of Grasse. I used several different yet complementary rose extracts to create this unique composition. I captured the scent of a live rose which I blended with a rose centifolia absolute to render the scent of fresh rose petals. In the end, the rose infusion boosted the intensity of the fragrance, generating a one of a kind, almost tangible floral bouquet. Additional notes include red fruits and honey. Diptyque Essences Insensées 2016 will be $180 for 120 ml Eau de Parfum. I am really looking forward to smelling this one. Me too! Really liked 2015.
me four! i have 2014, the mimosa scent and love it. Me five! And ditto. ???? OMG, this series has the best bottles! I couldn’t resist the mimosa one with the peacock feathers. It’s not only beautiful to look at, but there’s also something about the finish of the glass that feels lovely in the hand. And I really enjoy the perfume, too. This new one sounds great. Diptyque, I didn’t need this temptation right now! I have the 2015 and enjoy wearing the jasmine-based fragrance more than using the fussy sprayer. I’m a sucker for the look though, and look forward to smelling this one. Also, I particularly love the Los Angeles Diptyque boutique on Larchmont. They are so welcoming – and generous! The strategy works, as I rarely leave without making a purchase and scoring many deluxe samples, including candles and 15 ml sprays.